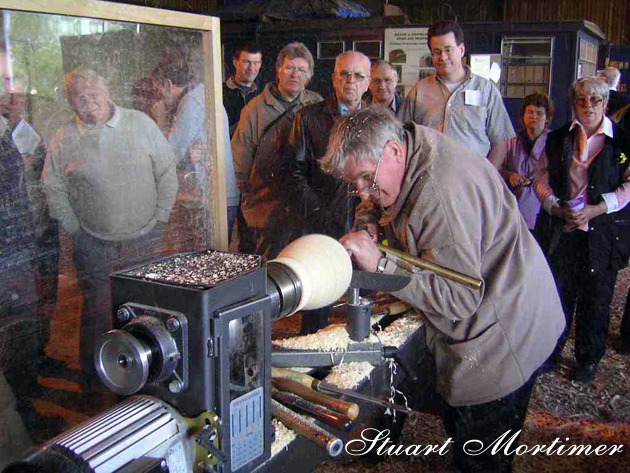 Stuart Mortimer is an internationally known woodturner with a wide knowledge in many aspects of turning. Stuart is a self-taught woodturner. He has built up an international reputation and is highly regarded by his peers and collectors alike in many areas of woodturning. He is a writer, teacher, demonstrator, and consultant to turners and turning groups throughout the U.K., Europe, Scandinavia the U.S.A. and Australia. I have been a fan of Stuart’s work for many years now. He is always trying to push himself into new areas of woodturning. I found out that Stuart is now adding silver and gold to his work with incredible results. His incredible twisted finials, beads and other forms of decoration are being handcut from solid silver. He is also on the register of the Worshipful Company of Turners and the Society of Ornamental Turners in London. Stuart Mortimer currently lives in Hampshire, England. Who could have thought that Stuart is a retired Police Inspector? He went on to win several national awards before starting to write both at home and abroad. He is well known and admired in international woodturning circles for his variety of work, fresh ideas and spiral work, traveling around the world, attending seminars and exhibitions as a sought after teacher and demonstrator. Stuart has an affinity with trees and their product and is continually on the lookout for the unusual piece of material. In fact, he admits to having scouts out there looking for him. Every piece of his work is hand crafted with meticulous care and finished to the highest degree for tactile and visual pleasure. He is the author of ‘Techniques of spiral work’ and has published a video titled ‘Wet Turning with a Difference’. I guarantee that you will be inspired looking through Stuart’s website like I have for many years.